"Cuvee De Nuit" is a low rectangular side table, designed by Stephane Lebrun and manufactured by Dessie', featuring a top in black MD walnut veneered or covered by black leather and a metallic base structure made of square section steel with an antique nickel finish. Indoor use only. DIMENSIONS: D. 13.7", W. 19.7", H. 19.7" Keeping alive the tradition of cabinet-making and adapting it to the contemporary aesthetic and functional needs in an economic field now ruled by industrial production is not an easy job. A lof of passion and great handcrafting skills are needed: it's something you can learn working in your family, just like what happened to Stephane Lebrun. STEPHANE LEBRUN was born in Belgium in 1973. His training in cabinet-making and architecture has enabled him to build himself the furniture pieces and projects he designs. This unique approach has opened the doors of prestigious places such as the Brussels Museum of Modern Art, the Manneken-Pis and the Belgium Museum of Embroidery. DESSIE' company's mission is putting a contemporary spin on the old tradition of cabinet-making, in order to offer pieces of furniture ready to get people excited and to satisfy aesthetic and functional values of the contemporary way of living. Dessie' was started during 1990s and now proposes a collection of pieces of furniture inviting to discover a sophisticated and elegant design, an unique style where different influences merge, and to re-create a simple and refined design atmosphere for unconventional people who are freely looking for essential and high quality pieces. A collection, including tables, small tables, writing desks, console tables, bedside tables, chairs, bookcases, dressers, cabinets, cupboards, upholstered pieces of furniture and lamps, which was created having in mind an essential style and a careful attention to recent trends. Harmony of forms and care for high quality and rational design, attentively studying any detail, are some of key features of production by Dessie', which has been always reworking the legacy from the tradition by means of a strongly contemporary design language. The aim is to create a forward-looking style which anyway doesn't lose the value of the past as a main feature, in order to give any setting an original charme, indifferent to passing fads. Hence here's a formal language which uninterruptedly takes care of details and precious finishes, while experimenting expressive capabilities of the best materials: precious woods, steel, leather, natural fibers, etc. Flexibility and possibility of customizing any piece in order to offer a "tailor-made" production is one of key design criteria followed by Dessie'. Dessie' established a close cooperation with some famous international designers, like the Catalan Jaime Tresserra, who designed "Tecnica" collection. Besides its own production, Dessie' has been taking the assignment of selecting products by some Spanish companies (Andreu World, Carpyen, Dae, Indecasa, Mobles 114, Punt Mobles and Tresserra) for many years, creating an unique and refined collection featuring bookcases, sofas, lamps, wall lights, chairs, armchairs, rugs, outdoor pieces of furniture, etc. 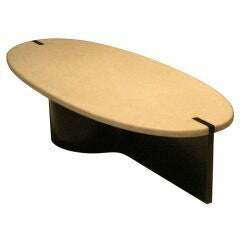 Available with top in black MD walnut veneered or covered by black leather.\nPlease inquire about the walnut veneered version, its related pricing and production lead time.\nCustom dimensions: price and delivery time to be agreed on demand. 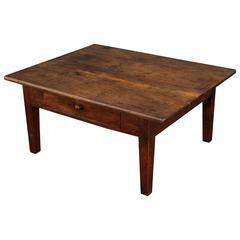 This table dates back to the Qing dynasty and was made from elm wood. The table features a beautiful aged patina; the lacquer is visibly worn on the elm wood top. Gorgeous rectangular solid mahogany coffee/side table lacquered in black. Low square tables of mahogany with fluted facing on all four sides. One small center drawer per table. An unusual piece for a cocktail table. Brass trimmed with a brass inlay on the centre of this low piece with lacquered wooden accents.